A famous Banksy artwork that depicted illegal British government spying has been mysteriously removed from a wall in southern England. The mural appeared overnight in April 2014 on the side of a house in Cheltenham, just three miles (4.8 kilometres) from Government Communications Headquarters (GCHQ), the British intelligence and security agency whose telecoms data collection was exposed by Edward Snowden. 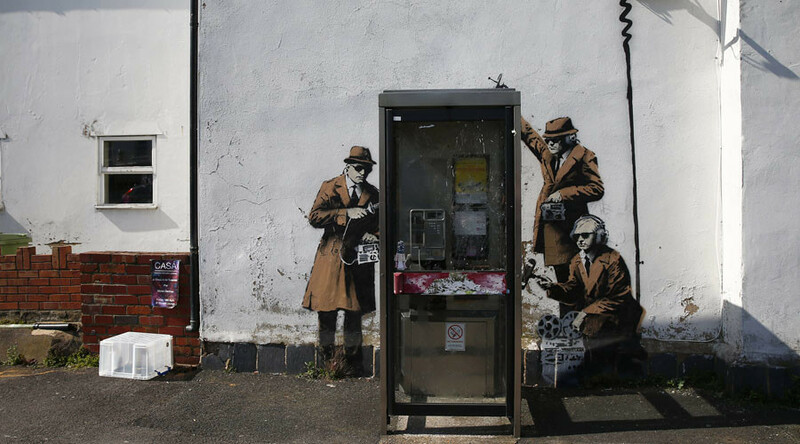 Entitled ‘Spy Booth’, the artwork featured three 1950s style spies listening in to a phone box, but the iconic artwork has been the focus of local controversy since its appearance. As a popular tourist attraction, the Cheltenham Borough Council granted the mural listed status in 2015, however the constant foot traffic became a headache for the homeowner and they put the house up for sale at the beginning of 2016. Vandals also defaced the artwork, and in June scaffolding was erected to carry out “urgent works” to repair plaster falling off the wall, make it weatherproof and stop further deterioration, reported the Gloucestershire Live. However, a video posted to Twitter on Saturday indicated that the artwork was being removed as heavy machinery can be heard behind tarpaulin hanging over the area. By Sunday morning, all that remained around the phone booth, was a pile of rubble. A Gloucestershire Police spokeswoman said they had had no reports of a crime being committed, reports the BBC. Other works by the elusive satirical street artist have been damaged, destroyed and even removed for auction over the past decade. In 2013, a work called Slave Labour was pulled from outside a north London shop and put on the market in a Florida gallery. After an appeal by Londoners, the artwork was withdrawn from the Miami sale, but was subsequently auctioned in London for £750,000 ($981,000).